Can't wait for the new consoles before grabbing AC4? There's an offer for that. Jeez, is it seriously October already? For some of us, that might be great news as "October" means Assassin's Creed IV: Black Flag is releasing this month. For others, "October" might induce some panic, but rather than talking about that, let's discuss that AC4 release, shall we? AC4 is releasing across more consoles than you can indicate with one hand, so it might be tricky to remember which release date is relevant to you. If you're planning on nabbing the game on the current generation of consoles (PS3, WiiU, or Xbox 360), just remember October 29th. PC and next-gen console release dates are a little less straight-forward, though. PC players will be getting the game on November 19th, following the standard Ubisoft procedure of delayed PC versions. The PS4 version drops on November 15th while the Xbox One version launches November 22nd. "But wait," you say. "I'm going to get a new console, but I want to play AC4 on October 29th." Maybe you're not saying that, but apparently retailers and Ubisoft think someone is saying that, because there will also be offers on trading in PS3 and Xbox 360 versions for PS4 and Xbox One versions respectively. Players who buy AC4 for the PS3 either via the Playstation Store or retail can upgrade to the PS4 version for $10. This offer will continue until January 31st, 2014. Trade in your Xbox 360 Assassin’s Creed IV Black Flag for an Xbox One version and you’ll get a $25 bonus credit on top of a minimum trade-in value of $25. Offer valid until December 31, 2013. Visit Amazon.com for more details. Get a guaranteed minimum credit of $50 for a limited time when you trade in Black Flag on the Xbox 360 for a new Xbox One version. Offer is available for a limited time exclusively for PowerUp Rewards members. Visit GameStop.com for more details. Trade in your Xbox 360 version of Assassin’s Creed IV Black Flag and get your Xbox One copy for as little as $9.99, through December 31, 2013. Visit Bestbuy.com for more details. Assassin’s Creed IV Black Flag for Xbox One will be available to purchase for as low as $9.99 with the trade-in of your Xbox 360 version. Offer valid through December 31, 2013. Visit Microsoft.com for more details. 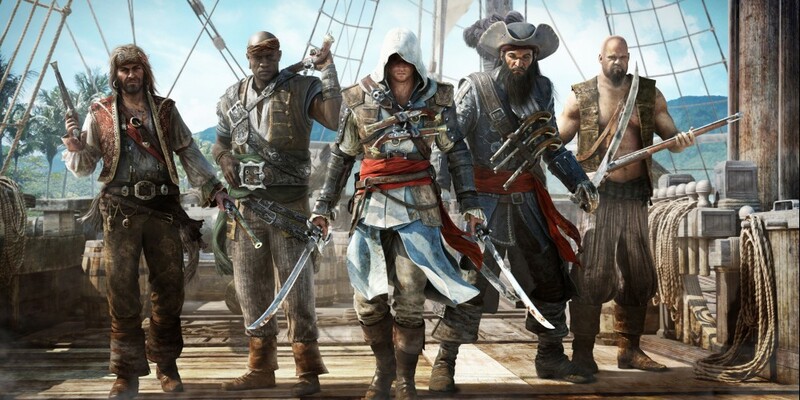 Assassin's Creed 4: Black Flag is shipping with a 4-player online co-op mode, called "Wolfpack" (also available in Assassin's Creed 3). So what do you guys think? Excited for AC4? Will you take advantage of any of the upgrade offers?